Full subway service still not restored after a train derailment in Harlem. Checkey Beckford reports. A subway derailment and power outage near the 125th Street station in Harlem suspended service on multiple train lines Tuesday, stranding terrified riders in darkened, smoke-filled cars for two hours in some cases. At least 34 people had injuries including smoke inhalation, though all were expected to be OK, fire officials said. About half of the victims were taken to hospitals while others were assessed at the scene. A subway derailment and power outage near the 125th Street station in Harlem suspended service on multiple train lines Tuesday, stranding terrified riders in darkened, smoke-filled cars for two hours in some cases. Jen Maxfield reports. MTA Chairman Joe Lhota said at a news briefing shortly before noon Tuesday that the brakes on the southbound A train somehow went into emergency mode, propelling the first two cars of the eight-car train into a concrete wall and off the tracks. Sparks erupted, briefly igniting garbage and other debris along the subway tracks, causing heavy smoke but no serious fire, Lhota said. The derailed train was evacuated, along with two other trains -- one ahead of it and one behind it. The train derailed very close to the 125th Street station, Lhota said, and some riders were able to get off on the platform. Other panicked straphangers looked for alternate means of escape. "In that moment, you're stuck underground, you are buried alive," passenger Dominique Simone later told News 4. "And I think that's the scariest part of it." 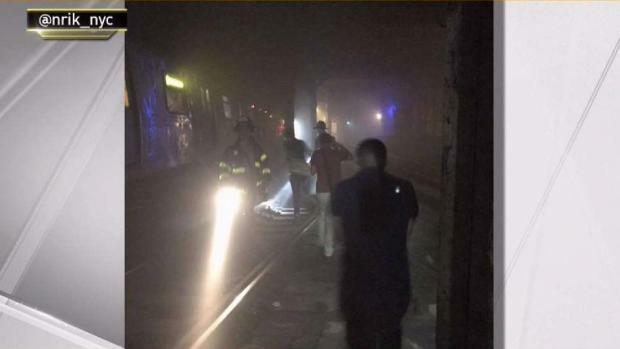 Photos posted to social media show passengers walking along the tracks in a dark subway tunnel, using their phone flashlights as a guide. Firefighters are seen illuminating the way. The MTA urged stranded riders on other trains not to get off their subways and to wait for directions from crew. A train derailment threw commuters into darkness on the subway in Harlem Tuesday morning, prompting an evacuation. Jen Maxfield reports. Major subway service changes were in effect for more than half a dozen lines most of the day. Though local service was restored on the A, B and D lines by the start of the evening rush, commuters were bracing for delays. The C train remains suspended. Click here for real-time updates. The derailment caused significant damage to the track, switch system and tunnel, dramatic photos released by the union showed. 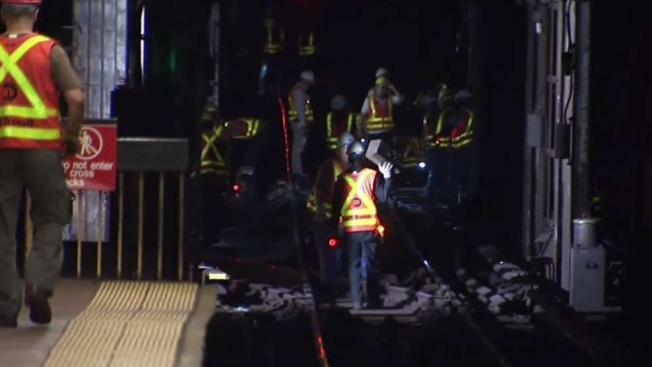 The MTA says crews will need to work overnight into Wednesday to remove the derailed train and make repairs. They're hoping to restore normal scheduled service in time for the morning rush. "It’s a serious derailment, with quite of bit of damage to signals and some structural damage to the walls," TWU Local 100 Vice President for the Maintenance of Wayn Division Tony Utano said in a statement. "Our members are working as fast and safely as possible to bring the system back to normal." At least 100 workers are at the scene, Utano said. Meanwhile, Lhota says the investigation is focusing on why the brakes went into emergency mode. Lhota pledged a thorough investigation. 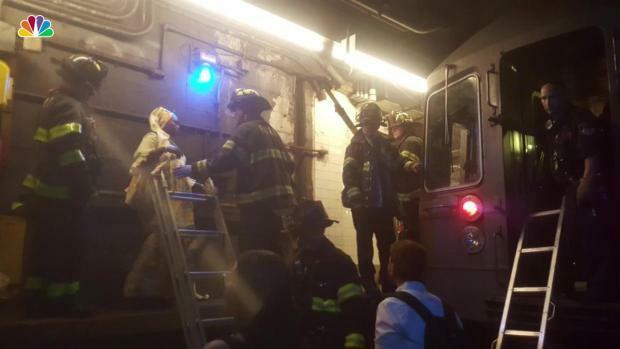 Pregnant women, children and families were the first rescued by FDNY from a train trapped underground after a train derailment Tuesday morning. Passengers describe the train vibrating wildly and bucking as it went off the rails. One rider described the experience as "probably the most terrifying 15 minute of my NYC life." One man told NBC News he initially thought the jerking was just a part of his normal subway commute. Then the shaking intensified. He says he saw what he thought at first was an explosion. All the lights went out. The train stopped. Like many other riders, he feared the train was on fire. Someone kicked out the glass of one of the locked car doors, but the next car was locked. So he jumped to the tracks. "I'm thinking, 'I just want to be off this train,'" the rider said. "And that’s scary too because you don’t know what’s going on, on the tracks." "Mostly everyone was shaken up and nerves frayed, but once we started walking there was smoke, so people started coughing," said Craig Sheil. Shout out to the MTA for making me late for work. Train lost power in between the tunnel and 125th street. Just flat out stopped running, Ac went off, lights went off, and everyone riding was left confused. Thank goodness the conductors on board let us out after a few minutes of waiting. A very special shoutout to Gov Cuomo who spends his time avoiding accountability instead of actually doing something about the subway system. The derailment comes amid a series of breakdowns, signal failures and other issues that have left straphangers at their breaking point. On Monday, the subway rider whose horrifying account of being stuck on a sweltering, powerless train earlier this month went viral held a news briefing to demand the MTA outline an evacuation procedure for riders who may get stranded in the future. It also comes less than two weeks before the start of Amtrak's summer-long work to repair aging infrastructure at New York Penn Station, a project that is expected to increase subway volume as commuters seek alternatives.